Note: the display of the three coordinates (green, black, blue) can be de-activated under show Coordinates on Ruler. After you have started PixelRuler for the first time, the program minimized as an Icon in the System-Tray. Now you should proof or modify some of the program settings (see Popup menu Settings). A click with the left mouse button onto the Icon (System-Tray) or ALT+F1 opens PixelRuler (another click minimizes the program). Press and hold the left mouse button to place PixelRuler on every screen position you like. Press Arrow keys (up, down, left ,right) to move the mouse cursor. Press SHIFT+Arrow keys (up, down, left, right) to move the whole ruler. The program remembers its current position, when you shut down it and places themselves after a new start on the old position. A doubleclick onto the ruler changes the ruler's alignment from horizontal to vertical and back again. To measure a distance, move the mouse cursor(5) over the ruler and you will get the actual cursor position(2), which follows the mouse cursor. It could be also very useful to change the ruler colors and transparency and to use the Arrow keys (left, right, up, down). You dont need to move the ruler to measure between 2 points. To start a measurement, move the mouse cursor to the first measuring position and press the space bar. Now you can see a red line (see picture below), which follows the mouse cursor. Go to the second measuring position and press again the space bar. Now you will see a red number, which shows the distance between both measuring points. To start a new measurement, press the space bar again, or you can cancel it by pressing the ESC-key. Example: we have started the measuring from "101" to "250", and got the distance "150". Open the following Popup menu with a right mouse button onto the ruler. Click on PixelRuler v9.6.0.0 or use ALT+F1 to show/hide the ruler on the desktop/system tray(see also Hotkeys). With Zoom a new window opens/closes, which shows the area under the actual mouse cursor with zoom factor 9. If horizontal is checked, the ruler's alignment is horizontal, otherwise it is vertical. Use change Ruler length with mouse wheel to decrease/increase the ruler in steps by 10 or 100 pixels. 1. previous Position: the ruler will be placed on his last horizontal and vertical position. 2. current Mouse position: the ruler will be exactly placed on the position where you have made the doubleclick - with full ruler length. 3. left Ruler corner: toggles the ruler position on his left corner. Use move Mouse with Arrow keys to de-/activate this function. Ruler always visible will show the ruler inside the visible monitor area. show Coordinates on Ruler will show the 3 values: actual Pixel position (green), virtual Pixel position (black) and measuring distance (red). You can use the ruler as a Reading help if you disable this option. Use Zoom window to change the view size (200x200, 300x300, 400x400, 500x500 Pixel) of the Zoom window. If Docking is checked, the ruler moves automatically to the screen border, when the ruler position is within the docking range. The Docking range can be within 10, 20 and 30 pixels. Use Transparency to let other programs, or the Window's desktop, show-through. Use Front- and Background to get a percent range of transparency. The submenu items Background (Ruler) and Background (Coordinates) make the ruler background and the coordinates background completely transparent. With Font style (Coordinates) you can set different fonts and sizes for the horizontal and vertical view of the ruler. Use Colors to change the ruler's background color as well as the scale and font colors. 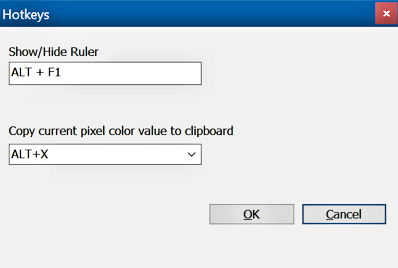 Pixel color value -> Clipboard: if the ruler has the focus, use (changeable Hotkey) ALT+X to copy the actual color value (as HTML, Long, RGB, TColor, VB, or Websafe value) to the clipboard. Use Hotkeys to change the keyboard combinations ALT+F1 to show/hide the ruler on the desktop, and ALT+X to copy the actual color value to the clipboard. Keyboard/Mouse usage shows a new window with an overview about all keys and mouse buttons which controls PixelRuler. A short Sound will be played if the current pixel color value was copied to the clipboard with ALT+X. You can support the development of PixelRuler with your Feedback on my Website. Use Help, or F1, to show the help file. Use Homepage to visit my website. Info PixelRuler shows license-/registration information. Search online for updates will be started once a week, and a message window appears as soon as a new PixelRuler version is available for download. The query does not send any personal data, but only an HTTP-GET request to a web page script on pixelruler.de, which answers with the current version number. Use Show Ruler on program start to directly show the ruler after you have start PixelRuler. With ALT+Arrow key you can size up the Ruler width to max. 100 Pixel. Use Font Style Coordinates to change the font size of the coordinates, and Colors for the Font- and background color of the ruler. You can use the ruler as a Reading help if you disable the 3 coordinates under show Coordinates on Ruler. Also you should use the same color for the Font scale and Background. 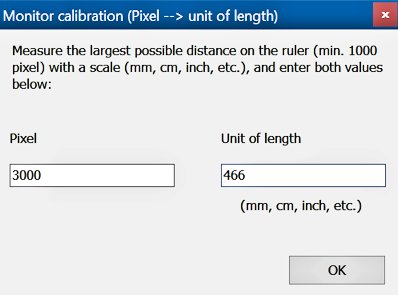 With show Coordinates on Ruler and the sub menu Monitor calibration (Pixel --> unit of length) you can measure in e.g. in Millimeters, Centimeters, Inches, etc. instead of Pixel. Use Transparency to let other programs, or the Window's desktop, show-through. The submenu items Background (Ruler) and Background (Coordinates) make the ruler background and the background for the running coordinates values completely transparent. transparency only works on NT-Operation systems (NT, W2K, XP, 2003, Vista, 7, 8, 10), and not with W9x and Windows ME ! it's possible that the zoom window does not show any transparent ruler ! The X- and Y-values show the system-wide mouse cursor coordinates. 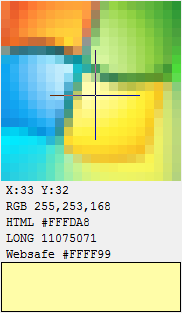 The RGB-, HTML-, LONG- and Websafe values show the current pixel color under the mouse cursor. Inside the zoom window you can use the Arrow keys (left, right, up, down) for an exact positioning. Use the changeable Hotkey ALT+X (system-wide) to copy the actual pixel color value (as HTML, Long, RGB, TColor, VB, or Websafe value) to the clipboard. A doubleclick will close the zoom window. The menu item Zoom window let you change the view size of the Zoom window. Click onto the red x button(1), or use the keys ALT-F4 to abort PixelRuler. If you only want to minimize PixelRuler as an Icon in the System-Tray, use the Hotkey ALT-F1, or the 1st popup menu item "PixelRuler vxxxxx". Tolles Tool, mit Colorpicker nd Lupe wärs noch cooler!